This week I wrote a guest blog post for my friend, Sandy Weiner. Sandy helps women with the dating scene and her business has a fabulous name: Last First Date. Check it out! Here’s my blog post for Sandy: Why Stunning Photography is Important! In 2010, there were 58 new posts, growing the total archive of this blog to 90 posts. There were 190 pictures uploaded, taking up a total of 291mb. That’s about 4 pictures per week. The busiest day of the year was November 22nd with 205 views. 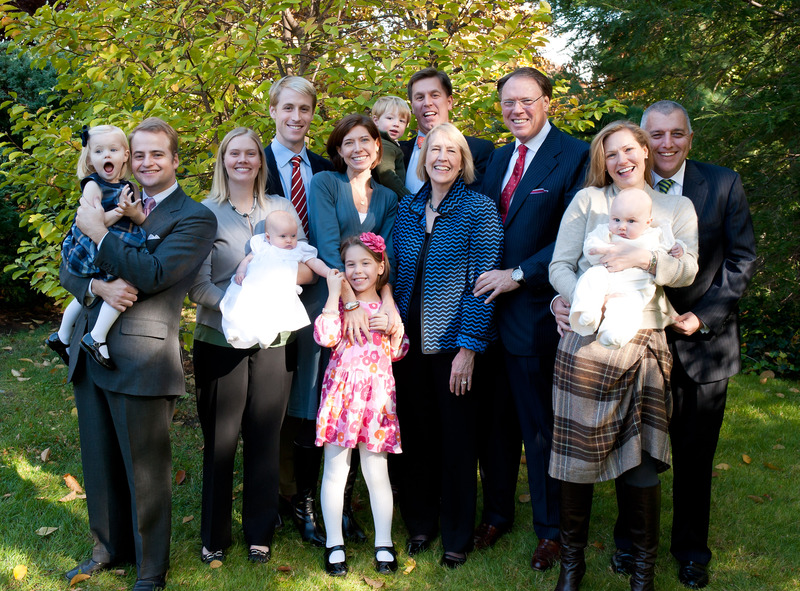 The most popular post that day was baptism and joyful family gathering!. The top referring sites in 2010 were blakerobinsonphotography.com, facebook.com, newyork.craigslist.org, mail.yahoo.com, and alphainventions.com. Some visitors came searching, mostly for philip johnson glass house, beauty, glamour model, glamour, and jessamyne. As many of you know, my photography exhibit “Up Close” opened last week, at the Darien (CT) Library. It was so terrific to greet many friends and acquaintances – as well as strangers – at the opening reception. We had about 150 people come, which was humbling and which also really blew me away! If you have not had a chance to see the show, I hope you will drop by the Library and check it out. The show will be up until October 25th. The work is for sale, and there is a price list at the front desk of the Library. I wanted to post a few pictures from the show. 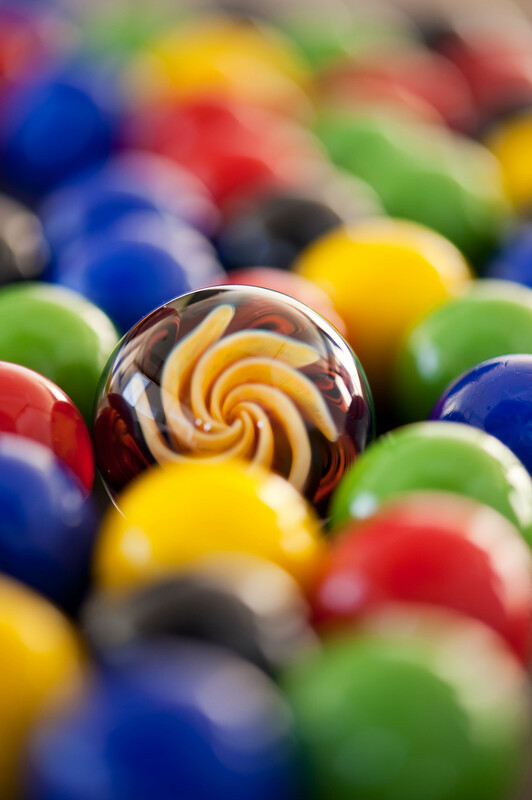 The image above is one of three photographs of marbles. These images are about color and depth of field. I was also trying to convey a metaphor of one (a person? an object?) that is “different” within a crowd of many. The image above is entitled “Lindsay Dreaming.” It was interesting at the opening reception to hear which pictures various people liked best. This was one of the favorites and it’s one of my favorites as well. I’m usually drawn to color, but this image definitely worked better in black and white. Aside from that comment, I don’t want to say too much about the picture! Better to let you interpret it from your own perspective. Most of the work in the show was created this year. 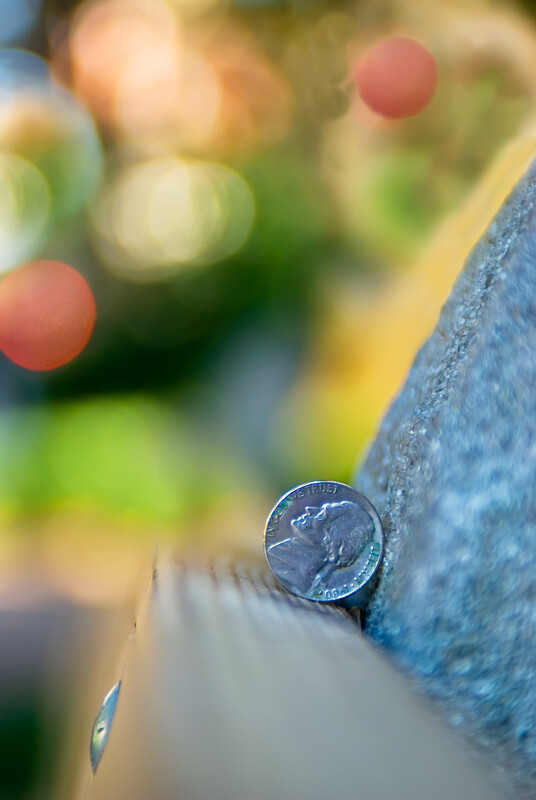 I did include a few older images, such as “Nickel on a Park Bench.” This was taken on a photography workshop in Savannah a couple of years ago. Our assignment for that day was to work on photographs using narrow depth of field – that is, the area in sharp focus is very narrow. In this image, the nickel and just a few inches of the bench are sharp, but everything else is fuzzy. The circles in the background were small colored street lights. I’m not sure I can understand the physics of how camera lenses work, but often small bright lights that are out of focus will appear as these lovely larger circles of light, which is called bokeh. In the show, I exhibited seven image of flowers. One of them is shown below. In all of these images, I used a close-up (macro) lens, shooting from about a foot away. The pictures in this series are, in part, studies of how light coming from different angles can help create a sense of three dimensions. 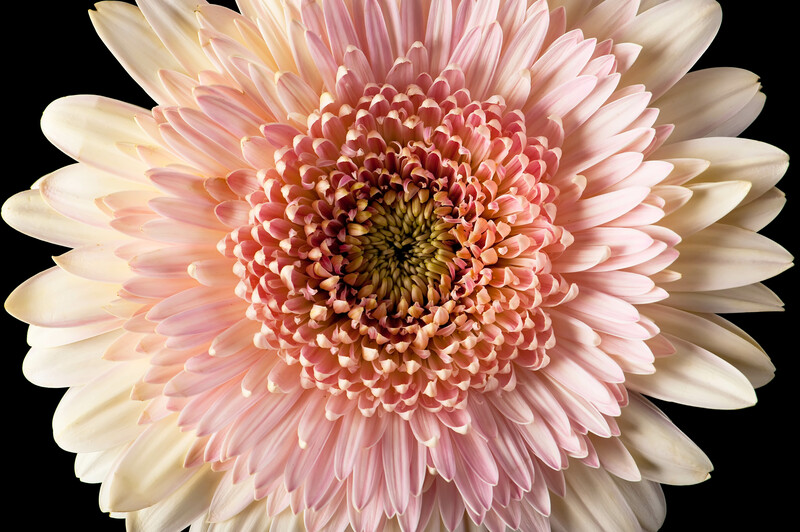 I was also drawn into and therefore wanted to emphasize the beautiful details of each flower, reflecting the rich variety of God’s amazing designs in the natural world. As always, any comments and questions are welcome.